Please do not copy, edit, alter, repost or trace in any way. I can't watch it without laughing! 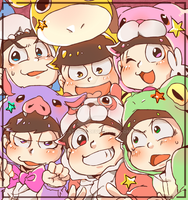 OSOMATSU IS THE BEST IN THIS ENTIRE GROUP SHOT, NO ONE CAN BEAT THE OLDEST BROTHER. is it bad that i headcanon all the matsuno brothers having good-looking legs, ESPECIALLY the eldest. karamatsu is my son. my sparkly nailpolished son. Season 2 is on its way! !